We’re starting to feel the buzz around The Open Championship, which is always one of our favourite times of year here at Plan Bee, and even more so when it is at the home of golf in St Andrews. But it also got me thinking. Are golf courses still maintaining their standing as lush, green rolling fields, an area for quiet, solitude and contemplation? Or, are they a waste of land that rather than enhance the environment, they potentially harm it? Are they a green oasis or a green desert? Around the world it is estimated that there are 35,000 golf courses, with just over half in the USA, while in the UK we have 2,600 clubs. Scotland has the highest per capita number of golf courses in the world, with the Scottish Golf Union reporting around 600 courses. The industry employs more than 29,000 people in Scotland alone, supporting 1 in every 125 jobs. 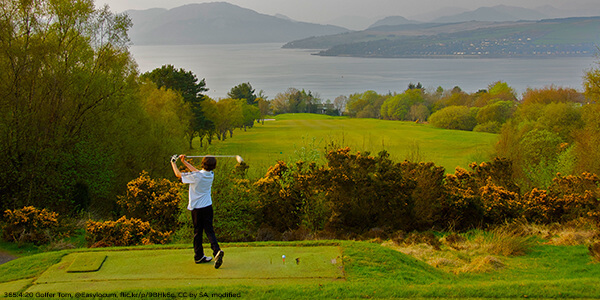 The latest KPMG study for Scottish Golf estimates the industry is worth £1.171Billion to Scotland’s economy, while the economic impact of golf tourism is around £220million. That’s a lot of golfers potentially voting with their feet and their wallets, and millions of them will be looking for a unique environmental selling point. In a time when we have a wealth of choices, multiple options for our disposable income and a myriad of businesses competing for our attention; consumers are becoming ever more selective on how they spend their time and money. This is a factor that golf course managers are acknowledging, with reports like Sustainable Golf Development clearly highlighting the importance of consumer choice in the future of the game and its many clubs. This is the game’s opportunity to give something back to their communities, to play a vital part in supporting delicate ecosystems and in particular dwindling honeybee populations. Around the world there is a growing frustration with golf courses. Often seen as purely middle class retreats, they are viewed by some as elitist. They can sap valuable resources particularly water, and potentially use harmful pesticides to maintain those vibrant greens and fairways, while many have replaced once rich farmland and others take up sites that could potentially be used for much needed housing. There should be a return, or at least a focus on redeveloping courses around a vision of social, environmental and economic sustainability – an extension of the games roots, an evolution of golf’s age-old values. After all, sustainability was part of golf from the start and it must be part of the game in the future. Many courses nowadays are situated on the outskirts of towns, they have replaced fertile farmland or take up land that could potentially be used for valuable housing stock. Rather than be seen as islands with a single purpose, beehives could help to make courses a focal point of this semi-rural environment. Bees can cover a radius of more than 6 miles from their hive, and that is a lot of neighbouring crops to pollinate, allowing golf clubs to play an important part as a pollination hub for their neighbouring community. Rather than sapping resources, introducing fescue areas could create something completely unique for courses and supporting delicate ecosystems, providing biodiversity where they may be surrounded by single crop farms, which can be detrimental to the health of local wildlife that requires diversity. Recent studies have also established the great potential for golf courses, with a higher species richness and abundance for bird and insect taxa recorded than on nearby farmland. Golf courses, and in particular their business elements and committees need to kick back, to answer their critics and come back with sustainable solutions of their own. Rather than be seen as green deserts, golf courses need to improve their image and use outlying areas more responsibly. Transform the rough by sowing rich, biodiverse wildflower meadows and install beehives in areas away from the run of play. In 2008 Fam et al estimated that globally a possible 50% or more of all species could be at risk from urbanisation. At Plan Bee we widely report on declining honeybee populations, with University of Reading research estimating the demise of half of the species over the last 20 years through mites, climate, disorders and poor pesticide management. With most towns having one or more golf courses, there is definitely a part to be played by course managers and these organising committees in supporting threatened honeybee populations and by extension our delicate ecosystem, and taking up a unique role within their community. Golf courses need to ‘pay the rent’ for their existence, enhancing their natural habitats and ecosystems, improving overall environmental quality and treading lightly on their natural resources. The perimeter of your course can be opened up, allowing the local community to use the area for walking, embracing nature and enjoying leisure activity. The eyes of the world have been on Scotland over the last 12 months, with golf going a fair way to enhancing our reputation for outstanding hospitality and beautiful scenery. The Ryder Cup at Gleneagles captivated billions of armchair golfers around the world. Views of the Swilken Bridge and the Royal & Ancient clubhouse coming up the 18th fairway will again inspire millions to play the game. But how can golf clubs ensure that they continue to attract new members? Clubs need to reach out to communities, to young people and ensure that they shake off the elitist reputation and offer something different. Plan Bee school legacy programmes, as part of a club’s beehive management programme can help to carry your message into the classroom, while our community engagement programmes and hive decoration can also bring colour and vibrancy to your course, or simply help them camouflage in to their surroundings. Alternatively, if you have parts of your course bordering busy motorways, roads or thoroughfares then hives can be branded with your club logo and messaging to be used as advertising space. I hope you enjoy The Open and have time to more widely consider the important part your own club could play in protecting the environment and supporting dwindling honeybee populations.